Admission for age 3 and above. Lest We Forget is a dance production that seeks to invigorate the ways in which we define the legacy of our forefathers—bequeathed to us through our desires to dream and strive for our existence as inhabitants and custodians of our Island, Singapore. 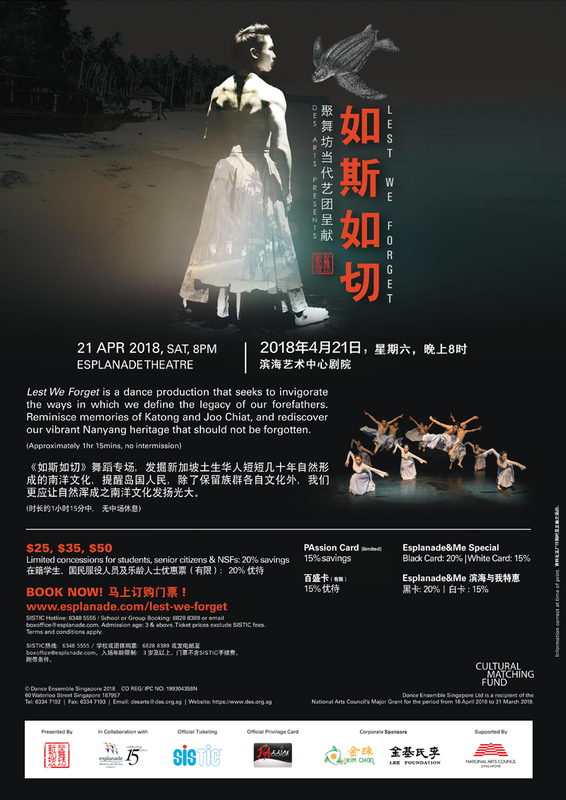 Through a series of choreographed dance presentations by the Dance Ensemble Singapore (DES) to commemorate its 25th anniversary, we are reminded to do whatever it takes to honour the sacrifices of our forefathers. Reminisce memories of Katong and Joo Chiat, and rediscover our vibrant Nanyang heritage that should not be forgotten.